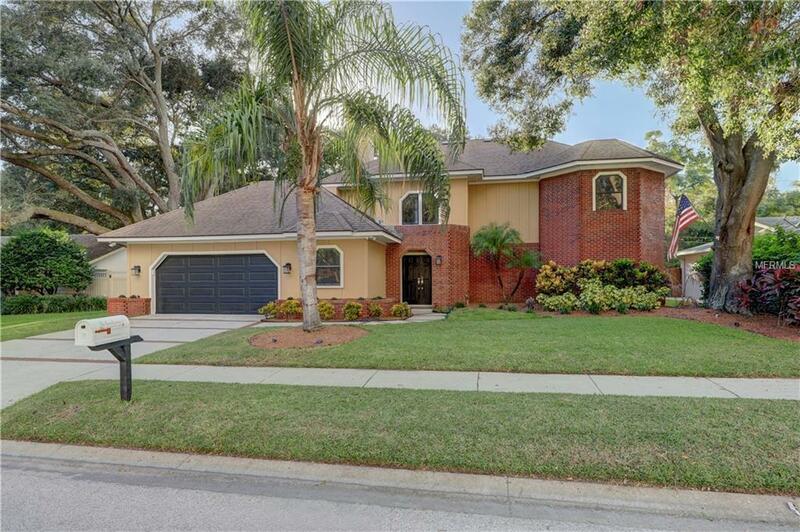 Updated Palm Harbor Classic Tudor style custom home in Lake Valencia backing to conservation! Enter into the spacious family room with hand scraped wood floors, vaulted ceilings, wood burning fireplace & conversation pit. Remodeled kitchen offering 42 wood cabinets, marble back splash, granite countertops, stainless steel appliances and travertine flooring. Separate bar area with wine cooler! Discover the master retreat with its own wood burning fireplace & completely remodeled master bath featuring dual sinks, custom tile work, whirlpool jetted tub & separate walk in shower complete with rain shower. Upstairs offers 2 full bedrooms with an updated "Jack and Jill bath. Entertaining pool side is a dream with covered outdoor kitchen that offers built in vented gas grill, refrigerator and bar leading to more covered deck area, large screened in brick paved patio and heated salt water pool with newer variable speed pump! Exterior of home painted October 2018. Lake Valencia is centrally located minutes from shopping, beaches, marinas and restaurants!